Located in the heart of Montoya, New Mexico, Richardsons Store initially provisioned railroad workers and ranchers and later expanded to serve highway crews and tourists on Route 66. Like many southwestern towns, Montoya began as a stopping point along a major railway. In this case, the stop was along the Rock Island Railroad. During construction of the line in 1901, Montoya became a settlement for a crew of workers. The town is roughly halfway between Tucumcari and Santa Rosa and was about a day’s ride from both at the time of its formation. Mesa Rica rises on one side and Mesa Las Palomas on the other. Mesquite, junipers, and cactus cover the landscape. Montoya residents and the surrounding ranchers depended on windmills and storage tanks for water. Even in this arid setting, G. W. Richardson, an experienced storekeeper from Missouri, sensed possibility. He moved to New Mexico and started a store in Montoya in 1908. In 1918, New Mexico began improving the road between Tucumcari and Santa Rosa, leading to substantial traffic through the town. As had the railroad crews and ranchers before them, highway workers boosted the town’s population and economy. They also patronized Richardson Store. The same year as the road improvements, Richardson relocated his store across the railroad tracks, closer to the road, and replaced his wooden store with the current red sandstone building. The road eventually became part of the national highway network and a leg of Route 66. Despite poor weather and marketing conditions and a resultant exodus of ranchers in the early 1920s, Montoya’s highway connection enabled the town to thrive with Richardson Store at its core. During the 1930s and 1940s, travelers found a cool oasis and something to drink under the tall elms that shaded Richardson Store. Designed to be as cool as possible, with a big portico out front shading the windows and the gas pumps, the store has a recessed front door and high windows designed to let in light and a breeze but not sunlight. The store adjoined a picnic grove and carried groceries and auto supplies for tourists and residents and also stocked saddle blankets, work gloves, feed buckets, and windmill parts for local ranchers. Like other local stores of the period, Richardson’s place was also a community meeting spot, complete with post office boxes and a postal service window. The portico is painted white to reflect the sunlight, as is the west side of the building, where bold, if faded stenciled letters read “Richardson Store." In 1956, crews built Interstate 40 several hundred yards south of the old Richardson Store. An interchange provided continued traveler access, but the distance and speed of the interstate caused a dramatic drop in business and ultimately the abandonment of the store. Old posters and local artifacts are still visible inside the front windows. Along the east side of the building, away from the area’s prevailing west winds, is the old Richardson residence, complete with a pump shed at the corner. Those who remember say that the Richardsons cultivated a wide yard outside of their dwelling, and that the area drew songbirds. The National Park Service listed the Richardson Store in the National Register of Historic Places in 1978. 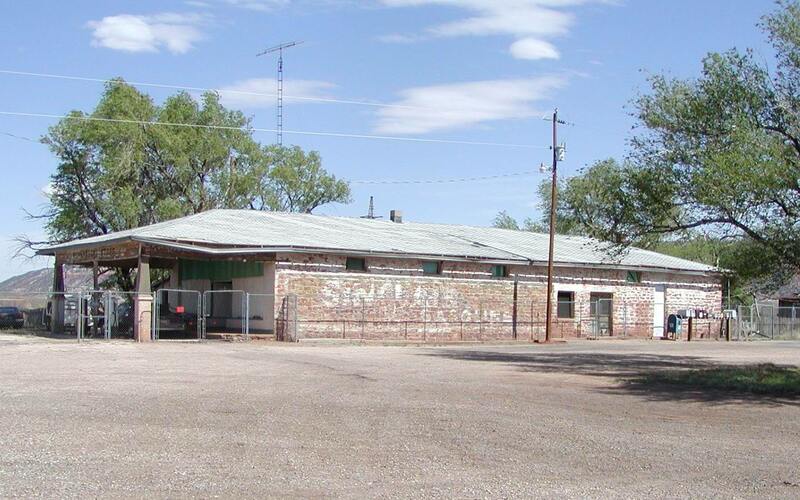 The Richardson Store is located between the Union Pacific Railroad tracks and Route 66 at the site of the village of Montoya, NM. It is presently vacant and closed to the public, and may be viewed from the road.